Any of our experienced vets are prepared to travel wherever necessary to examine horses on behalf of our clients and prospective purchasers not currently registered with the practice. We can also perform pre purchase examinations here at the clinic which has all the facilities necessary for a thorough examination. Wherever possible for a full pre-purchase exam the horse should be stabled, groomed with clean mud free limbs and feet, and without hoof oil. A dark stable is required to check the eyes and a flat level firm surfaced area where the horse can be trotted up and lunged. 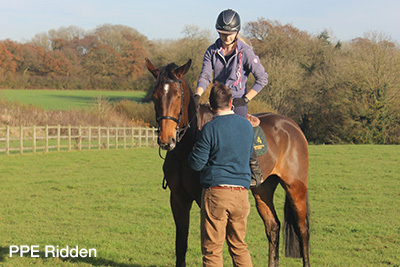 A rider will be required for a full pre-purchase exam (unless the horse is unbroken or very green in which case it can be lunged or loose schooled – the veterinary surgeon will note this on the vetting certificate) along with an area where the horse can be ridden. The horse’s passport needs to be provided for the vet to scrutinise. If the horse to be vetted belongs to a client of the practice or is known by the practice, we are still able to perform the pre-purchase exam, however we will require permission from the vendor to disclose the horse’s full clinical history to the prospective purchaser. If for any reason permission is not granted we would decline to perform the examination as it would not be considered to be acting in the best interests of the purchaser. The pre-purchase or ‘vetting’ is a thorough examination of a horse prior to purchase. The vetting is broken down into 5 stages (detailed below) and generally there are two types of vetting - two stage and five stage. 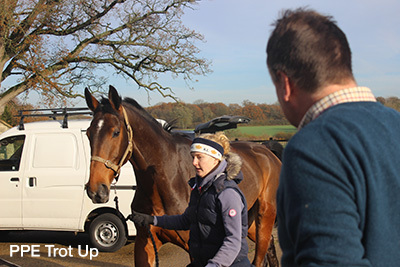 We always recommend a full five stage vetting which takes approximately one and a half hours; it is a thorough, methodical and professional examination of the horse that can assist you in avoiding the pitfalls of horse buying. We do offer a two stage vetting. However as this is a far less comprehensive examination we request that a form is signed stating that the purchaser understands the limitations of the reduced examination. This needs to be completed and returned to us prior to the examination going ahead. This is a thorough clinical examination of the horse at rest. 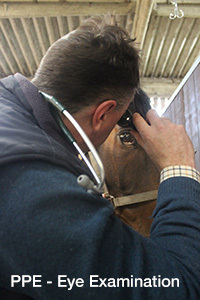 It includes an oral examination at which point the age can be estimated, auscultation of the heart and lungs and a thorough examination of the horse’s eyes in a darkened stable with an ophthalmoscope. The horse is palpated thoroughly to detect any abnormalities. The horse’s passport will be examined and the horse scanned for a microchip. 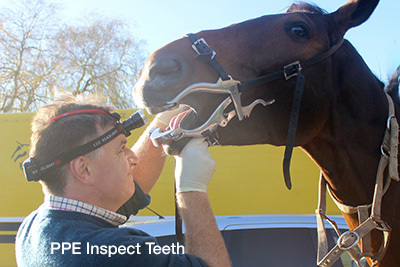 The horse is examined outside the stable and will be walked and trotted up on firm level ground. 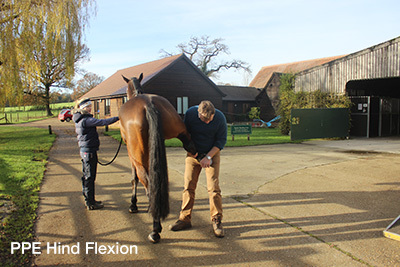 Flexion tests of all four limbs and lunging on a hard surface may also be performed at this stage if the attending veterinary surgeon considers it safe to do so. Tight turns and backing up will be assessed as a means to check for neurological concerns such as shivering, stringhalt or wobbler syndrome. The horse is then ridden, ideally in a sand school, where its gaits are assessed at walk, trot and canter (and gallop if appropriate). The horse is then given sufficient exercise to increase its breathing and heart rate. The horse’s age, fitness and proposed purpose are taken in to consideration. The heart rate and breathing are assessed immediately after exercise. Stage 4 – Period of rest. The horse is allowed to rest whilst its heart rate and breathing return to normal. During this period the heart rate and breathing are assessed for any abnormalities. A blood test is taken for storage which can be tested (at an additional cost) for sedatives or painkillers should the horse’s behaviour change or it go lame shortly after purchase. The vendor (or their agent) will be asked for written permission before the blood sample is taken and copies of this permission will be available for the vendor and the purchaser. The sample is stored for six months. The horse is trotted up again to assess for any signs of stiffness, strains or injuries exacerbated by the period of strenuous exercise. Flexion tests and lunging on a firm surface may be carried out or repeated at this stage. If the horse is expensive, eg. over £10,000, then x-rays may be considered. Often insurance companies request x-rays to be taken if a horse is to be insured for a high value. If you are considering insuring your horse (which we highly recommend) it is worth checking with the insurance company prior to the vetting as they often request certain views. X-rays may also be recommended if the vetting turns up something unusual, like a bony lump or swollen joint. The practice boasts state of the art digital x-ray machines which are fully portable. We advise all purchasers intending to insure their purchase to ensure cover is available and in place before completing the transaction and transporting the horse.